As we move towards the second month of the year, it is time again for a new release update of SAP’s Cloud for Service and Cloud for Sales tool. The timing of the release is as follows, the non-productive tenants will be updated on February 2nd and the production tenants on February the 16th. This blog will describe the highlights of the new release. SAP has acquired some strategic solutions the last year, like Callidus Cloud, Core Systems Field Service Management and recently Qualtrics. 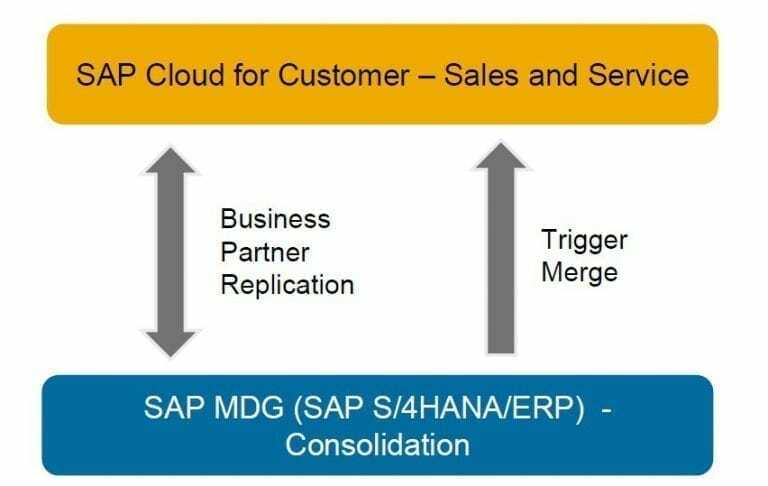 You can see that this has some impact on the newly delivered features in the Cloud for Sales and Cloud for Service, SAP’s main focus is on integrating the new tool’s so that customers can start using the new functionality. That being said, SAP does deliver quite some new functionalities that are coming from the customer influence program. So keep posting your ideas! The Account and Contact master data of C4C can now be integrated with SAP’s Master Data Governance (MDG) system. This bi-directional integration also supports an automatic merge of duplicates. In this scenario the duplicates are determined by SAP MDG and this system will trigger a merge in C4C. On the Account there is a new facet available called “Identification”, similar to that we know from on-premise. It can be used to display all ID’s like an ECC account number, Dun and Breadstreet number or Chamber of Commerce number. The 1902 release comes with functionality to support Delivery Priorities. Delivery priorities have been added to the integration flows for customer master data and for the transactional flows. The priorities are determined in Sales and Service Contracts, Sales Quotes, and Sales Orders. On the GDPR part there is a new option to schedule an Automated Personal Data Removal job. A bigger new functionality is the “Library with Folder Structure”. This will allow you to better organize your attachments and share your documents. 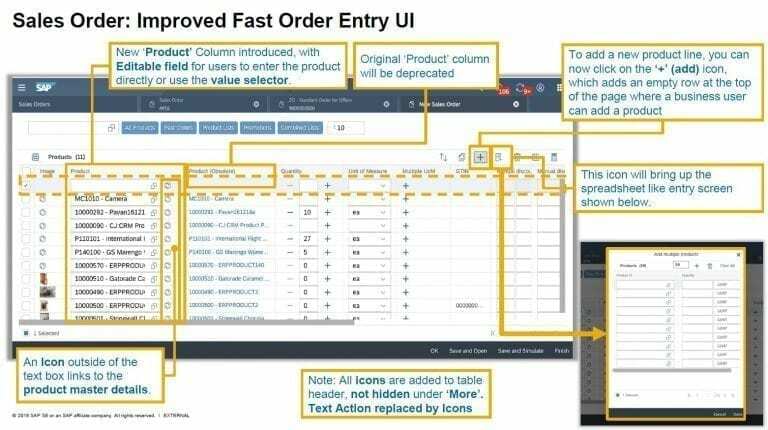 There are also some nice new features in the Fiori client. 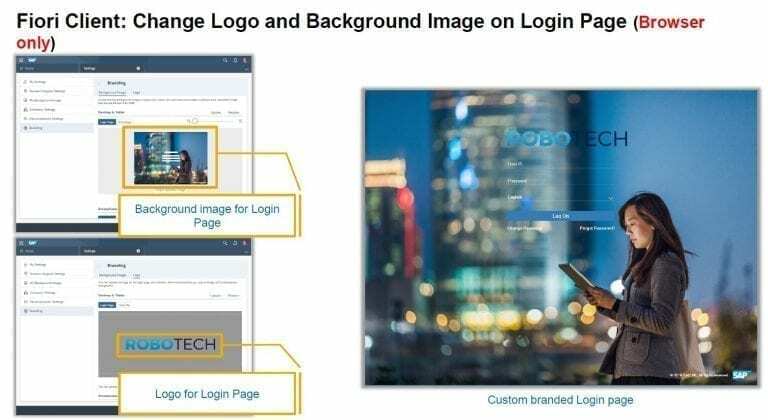 Customers will now be able to customize the login page with branding logo and background image. 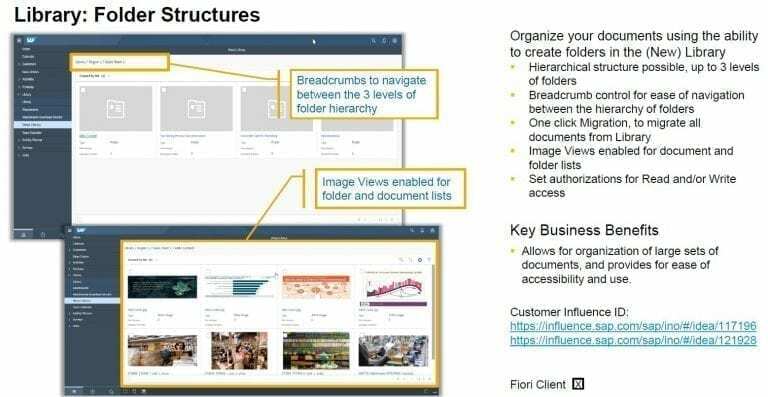 The KPI tiles on the Fiori homepage will be replaced by Home Page Cards, which provide better graphics and which will have new displays options in future releases. The home page cards also provide multiple click sections, so if card shows a list of recent activities, all activities are clickable and can be used to navigate to the mentioned activity. We have all encountered this problem. We search for a customer based on the name, and no customer is found, only the to see that we are searching in the “My Accounts” list and not in the “All Accounts” list. The 1902 release provides a solution, if no results are found a link is shown to automatically search in “All Items”. This will save some clicks and some irritation :-). The workflow emails sent from Cloud For Customer can now contain inline pictures, so the pictures no longer have to be stored somewhere on the internet. For third party integration scenario’s Cloud for Customer provides the Odata Event Notification functionality. With this functionality you can push a small Odata call to an external system containing only the ID of the changed object (Like Opportunity or Ticket). The 1902 release introduces the Next Generation “Event Notifications”, which a bit more advanced and comes with a dedicated message monitor. It also deprecates the older “Odata Event Notifications” . For some time now Android an iOS are supporting “side-by-side” apps on their devices. This gives a user the option to use two apps simultaneously. The Cloud for Customer app is now also supporting this feature both on iOS as Android. Furthermore, the camera is more integrated in to the app, on Activities and Visits you can now directly take and add photo’s as attachment without the need to leave the C4C app. 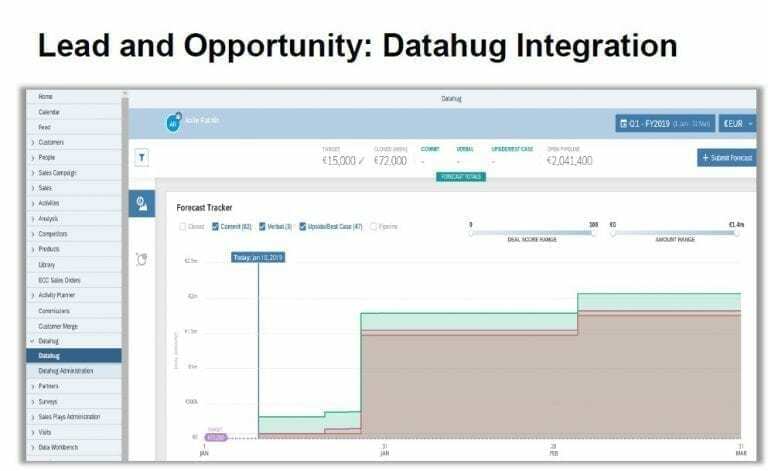 One of the big new features on Sales is the integration with Datahug, this is an advanced forecasting tool. Datahug allows you to upload your Opportunity or Lead history in order to perform a forecast analyses and predictions. From the Customer Influence Program, some ideas have been implemented for Sales. There are additional fields to search your opportunities: Serial ID, Sales Cycle, Sales Phase. Custom fields are now available in Revenue Planning reports. New Extension Scenario’s for Custom Fields on Account Sales Data to extend fields to for instance an Opportunity. Code List Restrictions functionality is now also available on the Forecast Fields. 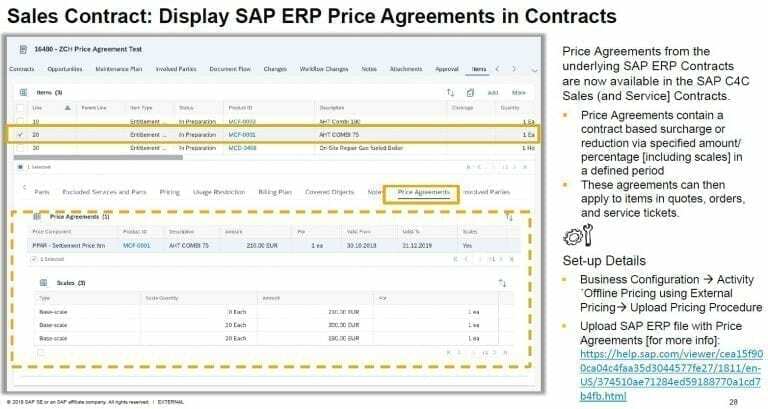 For Sales Contracts (and Service Contracts) there is a new facet available to display the price agreements from the ECC or S4/HANA back-end. This provides direct inside in the price for a specific product. For the contract determination the Sales Area has been added to list of checks. On the contract it is now possible to write internal, and as well as external notes. The external notes are avaible for the Contract summary. The creation of surveys on the production tenant was previously a manual effort. In the 1902 release Survey’s have been added to the Unified Transfer Management system. In a survey we can now use a rule framework to add the products to the Survey, this limits the amount of survey variants required. Another way of receiving tickets is the email channel. Previously only emails that were forwarded with to the C4C email addresses in the TO field were processed by C4C. Emails sent to C4C in BCC are now also processed by C4C and they will be shown in the ” Unassociated Email” work center view. Special for the Chinese customers as of this release C4C supports WeChat integration for a B2B Service Scenario. For Service Management the use of SLA’s is very customer specific. Cloud for Service already supported the SLA profiles for, Initial Review, Response, Resolution and Completion. With the new release customers will be able to create custom Mile Stones, which are always linked to custom date fields. For the Next Response SLA an option is added to suppress the SLA error, that a reply to the customer is mandatory, when completing a ticket after customer response. When using Case Management in Cloud for Service a Main ticket is representing the Case, and Sub-Tickets as object on which the customer and equipment’s are linked. With 1902 we are able to perform more updates to the sub-tickets directly from the Main Ticket. The following mass updates are now supported: Set Status (already existing), Assign to me, Assign to Team, Set Priority, and Add Note. All we need now is to be able to send an outbound email, my idea is still available on the customer influence site.